Glover Quin is an American football cornerback for the Houston Texans of the National Football League. Selected by Houston Texans in the fourth round (112th pick overall) of the 2009 NFL Draft. PRO: Young corner looking to make an impact as a rookie...looks to get time as the team’s nickel corner. Made his NFL debut vs. the New York Jets (9/13) as the nickel corner and recorded four tackles, including three solos, and had one tackle on special teams...had one tackle at cornerback and one on special teams at Tennessee (9/20)...made three tackles (two solo) and one special teams tackle vs. Jacksonville (9/27)...made his first NFL start vs. Oakland (10/4) and responded with five tackles (four solo) including two tackles for a loss...made four solo tackles and a pass defensed at Arizona (10/11)...made three tackles (two solo) and had a pass defensed at Cincinnati (10/18)...made one solo tackles and had a pass defensed vs. San Francisco (10/25)...made seven tackles (five solo) in Texans win at Buffalo (11/1)...made his sixth consecutive start at cornerback and made six solo tackles and had four passes defensed at Indianapolis (11/8)...made four solo tackles and had two passes defensed vs. Tennessee (11/23)...made four tackles (two solo) vs. Indianapolis (11/29)...inactive at Jacksonville (12/6)...returned to the lineup and made eight tackles (seven solo) including one for a loss vs. Seattle (12/13)...made three solo tackles at St. Louis (12/20)...made four solo tackles at Miami (12/27)...tied for the team lead with seven tackles (six solo) and had two passes defensed vs. New England (1/3). Played in 36 career games (34 starts)…earned consensus first team all-MWC honors in 2008 after being an Honorable Mention pick his first two years...named 2007 1st team all-MWC selection…helped lead the Lobos pass defense to a No. 20 national ranking in 2007...finished his career with 156 tackles, a school record 32 pass break-ups and seven interceptions…graduated with a degree in Business Administration in December of 2008. Attended North Pike HS in Summit (Miss. )...four-year letterman in football and basketball, and was the Jaguar’s team MVP in both sports as a senior...totaled 2,552 rushing yards, 224 tackles and 13 interceptions in his prep career...played for head coach Adam Barron...received the U.S. Army Scholar-Athlete Award. 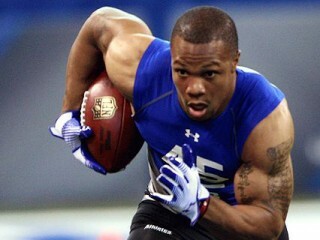 View the full website biography of Glover Quin.